Maven project is opened in Visual Studio. 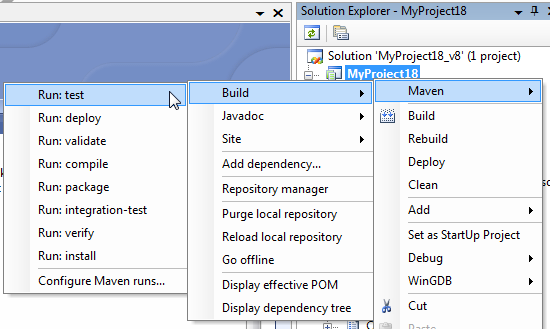 You can find instructions how to create a Maven project in this section. Maven offers several predefined lifecycles consisting of various build phases. Users can also define thir own lifecycles and phases. On the other hand, Visual Studio offers much simpler mechanism, defining only three standard activities: Build, Clean and Deploy (there is also Rebuild, being a sequence of Clean and Build). It is reasonable to map them to relevant Maven build phases, but these are customizable. Therefore IntegraStudio allows to configure these default build phase names. You can now enter appropriate names for Build and Clean phases. Default names are compile and clean. That means Maven will only compile sources on pressing F7, which is the fastest option and still allows debugging. If you want compiled classes to be packaged into a JAR, change compile to package. Entering install will order Maven to install generated package into local repository. You can find more information on build phases in this section of Maven docs. Optionally, you can also specify Maven profile (or a set of profiles) to activate. You can find more information on profiles in this section of Maven docs. The Name column specified the visible name of the execution. The Maven arguments column shows actual arguments given to Maven. Double click on any of the fields to edit value. You can also add a new execution, remove existing one or alter the order, by using buttons below the list.